One issue which sometimes arises with ride-on railways is being able to guarantee that all rolling stock does not derail, even under very large changes in loading, or on uneven track work. Unfortunately, not all track is as smooth as it may first appear, and derailments may (and do) occur due to insufficient suspension compliance, often due to too-stiff springing. The only way to achieve good rolling performance of rolling stock and carriages is to have a compliant suspension system. It is very desirable to have equalised suspension systems, on tenders, and locomotives as well as on cars, and this is regarded as the best solution. In fact, provided there is equalisation in the suspension, springs are not really needed at all to achieve good tracking, but the ride may be 'harsh' as every minor bump in the track is transferred to the frame or car body. Springing also plays a part as well, and forms part of the suspension system. It absorbs any harshness, and often provides the equalisation function as well. But problems can arise in springing when the loading varies. This occurs on locomotive tenders which carry a driver and in passenger carrying cars when the difference in load between when empty and loaded can be very great. For example, a car body may weigh say 30kg empty (excluding the bogies), but when 3 adults of say 70-100kg each sit on the car, the weight suddenly changes to 240-300kg or so. The loaded/unloaded ratio is approximately 10:1 between loaded and empty. Similar issues arise on scale model vehicles which are also sometimes used to carry 1 (or 2) passengers. When spring rates are selected to suit one loading condition, it invariably does not suit the other. For example, springs chosen to suit the unloaded weight are too soft for when the car is loaded. This can lead to excessive suspension deflection, with parts of the bogie or vehicle actually scraping the rail, excessive body roll and loss of stability, or even disengaging couplers. Similarly, spring rates chosen for the loaded situation may be too stiff to give any suspension compliance when unloaded, and the vehicle derails when one of the wheels is lightly loaded and tends to lift off the rails due to track variations. A proven solution to this problem is dual rate springing. The idea is that the softer springs are the default operating springs, and when the vehicle is loaded these will compress, but when they reach a pre-determined deflection, a second set of stiffer springs comes into action which now take the majority of the load. These harder springs are rated for the full load. Dual-rate springing is used in full size railways on some ore trains where the loaded/unloaded ratio is around 5:1, and also on road trucks and semi-trailers. It is not as difficult as it seems to incorporate into a model of any gauge or scale. Although this article shows how to implement dual rate suspension on a scale car, it is equally applicable to normal passenger carrying cars used for paying passengers, or the tender of a steam locomotive. 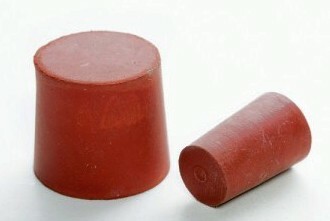 An example for larger coil springs using cheap readily available rubber stoppers is pictured below. A similar arrangement can usually be incorporated into any model with some thought and without too much work. The end result is largely invisible unless you look closely. Below is a description of how to incorporate dual rate springing into a 5"g scale freight wagon which may also carry a passenger, but the ideas and principle can be applied to any vehicle of any scale/gauge. It is also desirable not to spoil the appearance of the scale wagon. This example uses typical freight style bogies with 4 coil springs on each side of the bogie, and this wagon rolls and tracks very well with 0, 1 or 2 passengers. Click pictures to enlarge. The completed scale wagon, a 5"g model of the NSWGR CGX 33ft ore concentrate carrier, and a photo of the prototype (now recoded as NOEF) (right). Layout of the springs on each side of the scale freight bogie. All 4 springs are the same, and the rates are selected to suit the unladen weight of the wagon. View of scale model 5"g bogie. Total spring length is 30mm, and vertical movement available is approx 15mm when the springs are fully compressed. This photo shows one wheel only raised 10mm with the wagon unloaded, demonstrating the unloaded compliance possible with properly selected springing. ALL other wheels stayed on the rails. Resistant to the effects of the outdoor environment, particularly sunlight. Why use a rubber block, and not just strong springs? Strong springs are OK, and may be used if desired, but springs are linear and will continue to compress with even more additional loading, which may lead to excessive suspension travel as before. Springs ultimately just compress solid with no more give, and are effectively a solid steel block in this condition. Springs are also more difficult to mount so they stay in place with the 2mm free space required above them, they tend to move about or fall off. Rubber is non-linear in its compression and the spring rate increases as the load increases. Rubber retains its compliance, even though heavily loaded. It will compress only so far, but even when fully compressed, retains the 'softness' and 'give' desired for suspension. Rubber has also been successfully used as springs on road motor vehicles (e.g. the original 'Mini' car in the 1960s), and is still used as the suspension stopper on many vehicles. Industrial rubber is also usually black or dark grey in colour, and as rubber cannot be painted in a durable fashion, a dark colour is preferred as it is easy to 'hide' away without being obvious. Positioning of the rubber block between the springs. It just sits there and is held captive by the bogie sideframe at the ends, and by the springs sideways. Looking from the side of the bogie, the height of the rubber block was determined to give approx 1.5mm to 2mm vertical suspension travel before resting on the rubber block. This amount of travel is all that is needed to achieve desired suspension compliance in the unloaded state. The unloaded spring rate was selected so it is possible to lift any of the bogie wheels, one at a time, >10mm off the rail. This permits the wagon to work over even the roughest siding track work comfortably without derailing. Close-up of rubber block & springs. 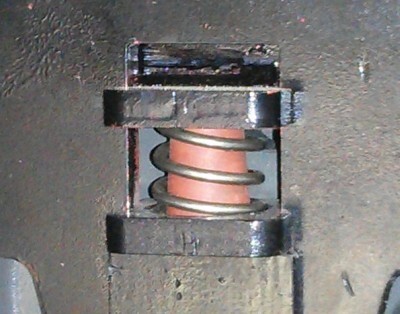 Close-up photo of springs and rubber block on scale bogie. When loaded, the wagon suspension compresses the springs until it hits the rubber block, which becomes the active spring. The rubber block prevents any further significant compression of the springs. The rubber, while hard, is soft enough to act as a spring and tends to bulge sideways when loaded. It also absorbs any harshness from the track. Compliance is the ability of the suspension to raise or lower each individual wheel independently, and for the sideframe to be flexible enough to 'twist' to accommodate the inevitable variations in track work. The suggested compliance for each wheel individually is 10mm for 5" gauge, and 13mm for 7¼" gauge, or proportioned to suit for other scales/gauges. Actual experience has shown that vehicles which can do this do not derail from vehicle related causes. A good way to check compliance is to place a solid block of this size on the rails and slowly push the vehicle over it, forcing 1 wheel to rise up over the block. While the wheel is raised, carefully look at the other wheels - they should all stay on the rail and not lift. If they do, the springs are too stiff, or there is insufficient compliance (movement) available in the sideframe/bogie assembly. Repeat for each of the other wheels. The suggested amount of vertical suspension travel before the higher rate springing becomes active is 1.5~2mm for 5" gauge, and 2~3mm for 7¼" gauge, and proportioned to suit for other scales/gauges, or as determined by experiment. Cutting a thick rubber sheet accurately and cleanly can be difficult. Mark out the desired shape, and place the large sheet on some sort of support, approx 10-20mm thick, so that the waste piece is raised off the bench top. Use a SHARP industrial knife, like a carpet knife or box cutter knife, and a metal straight edge. Clamp the fixed part to the bench with G-clamp(s) or similar, and make a shallow (say 0.2~0.5mm deep) cut along the marked line. Place a weight, or press using your hand, on the suspended piece so that the cut opens up and does not tend to close and clamp the blade. Now continue to make many small cuts along the line while bending the sheet down slightly. It is possible to get a clean, straight and square cut this way, but up to 50 or even 100 shallow cuts may be required. Just many small cuts, while placing some pressure on one side of the cut to keep it away from the blade, is the key. A little practice is all that is required. This article is Copyright � 2007 D. Archibald. You may not copy, transmit and/or publish any of the graphics or text in print, electronically, on a website or in any other way, without written permission. The author retains all rights to this work, except you may save a copy on your computer or print a paper copy, for your own personal use.